Low prices. OrangeSmile.com offers car hire service in Antilles on the lowest-rate-guarantee basis, since we work with car suppliers directly. For your search criteria in Antilles, we always select and show the best rental offers. The car reservation process consists of 3 simple steps: (1) search for available cars for your dates in Antilles; (2) select your car type; and (3) fill in the booking forms. Once the reservation is completed, you will receive a confirmation voucher to your email address. During the booking process, please check your rental conditions. To pick up your car at the rental point in Antilles, you need to provide our confirmation voucher, your driving license and a valid credit card. The final payment is normally carried out at the pick-up point. Our car hire points in Antilles accept VISA, MasterCard, etc - please check your rental conditions. At the pick-up point, please read the handling manual and check the car for present defects. 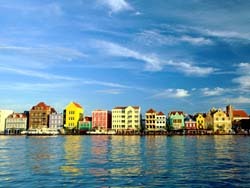 OrangeSmile.com wishes you a pleasant journey to Antilles! The car hire reservation system OrangeSmile.com allows renting a vehicle in Antilles within 10 minutes. Our largest database of car suppliers enables us to provide you a rental car in Antilles at the cheapest rate ever possible. At rental locations in Antilles we offer the following car sizes: mini, compact, economy, standard, premium and luxury. The following car types are available in Antilles: Sedan, Hatchback, Jeep, Cabriolet, Coupe, Minivan and Minibus. The Antilles are well known as a center of beach tourism. Guests of the islands will be pleased to find several hundred beautiful beaches, magnificent parks and nature reserves, as well as numerous historical landmarks, interesting architectural sights and museums. The best way to get acquainted with main landmarks of the islands is to visit the island of Curacao, which is home to the biggest medieval complex - Fort Amsterdam. The fort was built in 1635 and is currently used as the government's residence. In the past, the fort was used as a protective facility, so all the inner premises were turned into casemates in order to counter a possible attack. The Museum of Curacao, which is open in one of old buildings, is among the most interesting cultural destinations on the island. The museum exhibits different collections and many interesting items, such as pictures, elegant furniture, maps, old working tools, craftworks and much more. Tourists are also recommended to pay attention to the following museums: the Marine Museum, the Fort Amsterdam Church Museum, the Jewish Cultural and Historical Museum and Kura Hulanda Museum. Travelers, who want to get acquainted with local flora and fauna, are recommended to visit the island of Bonaire. This island has quite an unusual nature - its northern part is covered by hills and dense forests, while the southern part is mostly a steep one. Thanks to such a unique contrast, it's possible to see many different species of animals and numerous types of plants. There are particularly many birds on the island - more than 200 species. Fans of scuba diving will also fall in love with this place as local waters are home to more than 500 species of fish, rare sea turtles and more than 70 types of seaweed. Continue your exploration of the Antilles with a visit to Kralendijk as this island has much to offer to travelers. Magnificent parks, old architectural landmarks, museums - Kralendijk is very diverse. An excursion to Fort Oranje, which was built in the seventeenth century, will leave many pleasant memories. A part of halls of the fort was transformed into the historic and marine museums, while the remaining rooms have become port offices. There is a lighthouse near the fort, which has become one more symbol of the island. The museum of Bonaire is a great place to learn more about the culture and history of native Indian tribes. Fans of wild nature should not forget to visit the uninhabited island of Klein Bonaire (Small Bonaire). This small island has nothing but spacious beaches, numerous birds and impenetrable jungles. The part of the island is a reserve zone and is protected by the government, and the remaining territory is free to visit. Finally, the oldest buildings on the Antilles can be found on Rincon. There are also several interesting markets and restaurants on the island. When traveling in a group, consider a minivan option - it will be cheaper than renting a couple of standard-size cars. Please note that in Antilles vehicles with more than eight seats require a special type of driving license.